What's In It Wednesday - Taking a closer look at kd! Welcome to What’s In It Wednesday – Part 1! This is the first installment in a series of posts that will take a closer look at some common household pantry items. We will pick apart the ingredient list and then you will be left to decide how often a particular item makes it into your shopping cart. My goal is to inspire you to think outside the box and stretch your culinary skills from time to time. Yes, I know KD was a staple in many of our homes growing up. Somehow it seems like a rite of passage for childhood and dorm room living. My intention is not to rain on anyone’s parade but to simply point out what’s in it and why you might want to avoid certain ingredients. 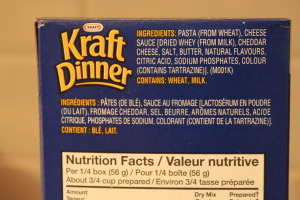 As a point of interest, I couldn’t find the ingredient list on Kraft’s website anywhere. I looked it up online and then had to go to the grocery store to confirm. The formula for our American neighbours is slightly different than ours. Kraft is attempting to appease the masses by now offering organic versions of macaroni and cheese. So far, these varieties are only found in the United States. In Europe, many of the controversial ingredients simply don’t exist in their boxes. 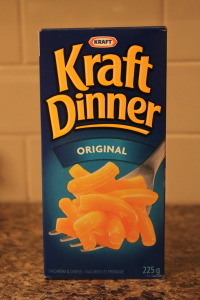 Kraft can do better for us too and are beginning to make changes here in Canada. That being said, why not make your own macaroni & cheese in about the same time with whole grain noodles and real cheese? Pasta (from wheat) – The noodle is made with white flour that has essentially been stripped of its nutrient value. The bran was removed and the flour processed removing the naturally occurring vitamins and minerals. If the flour used was enriched, it means that a handful of synthetic (read laboratory made) nutrients were added back in to boost the nutrient level. Let’s start at the beginning. Before we take a closer look at each ingredient in the cheese sauce mix, let me share a little background information. In Canada, our dairy cows are not allowed to be given recombinant bovine growth hormone or rBGH, an artificial growth hormone. The purpose of this hormone is to keep cow’s lactating longer than they would naturally and producing more milk than they would naturally. Processed food companies are not required to list bovine growth hormone on their ingredient list. When dairy ingredients are added to food, they are commonly from American cows that have been given rBGH. Whey: This is the remaining protein rich liquid after milk has been curdled and strained. Assuming it is coming from healthy cows without bovine growth hormone and organic, I really don’t have an issue with it. It is used in many processed foods and also in protein powders. Cheddar Cheese: Might be okay…the issue again is that this ingredient may contain rBGH. Salt: Regular table salt has been bleached and no longer contains the same amount of trace minerals as sea salt. Butter: If it is from Canadian cows, I give it thumbs up. If it was organic butter, I would give it two thumbs up. Natural Flavours: The actual ingredients used in natural flavours don’t have to be listed. Natural flavours can be simple and straigh forward or they begin natural in origin and have undergone more chemical processes than artificial flavours, making them sometimes worse than an artificial flavour. Sources of natural flavours can include insect and animal. I would like to know what is being put in my food to make it ‘flavoured.’ How about you? Citric acid: This sounds friendly enough, but let’s look a little bit closer at citric acid. Back in the good old days, all citric acid used to come from citrus fruits and was used as a food preservative. This all sounds harmless enough but wait, there is more. In the early 1900’s, it was discovered that citric acid could also be made from Aspergillus niger, a black mold that commonly grows in homes. “Black mold is able to efficiently (and cheaply) convert sugars into citric acid. By feeding sucrose or glucose, often derived from corn starch, to the black mold, a citric acid solution is created. Corn is highly likely to be genetically modified (GMO). I can’t confirm this, but I’m guessing that most food companies are using the most cost effective method available to produce their product, the synthetic version. Sodium phosphate: Another preservative and another source of sodium. Note about phosphates: have been linked to kidney disease, heart disease, early mortality rates and rapid aging. Colour (contains tartrazine): Here in Canada, food manufacturer’s don’t have to list all the colouring agents that they use. We do know that Yellow 5 or tartrazine as it is also called is part of the blend. This food colouring has been linked to hyper-sensitivity and hyperactivity in children as well as behavioural issues. It is petroleum based. Yellow 6: Also an artificial food colouring also known as sunset yellow. Has been linked to adrenal tumours in animals and hyper-sensitive reactions in children. Read more info on Kraft’s re-formulation. 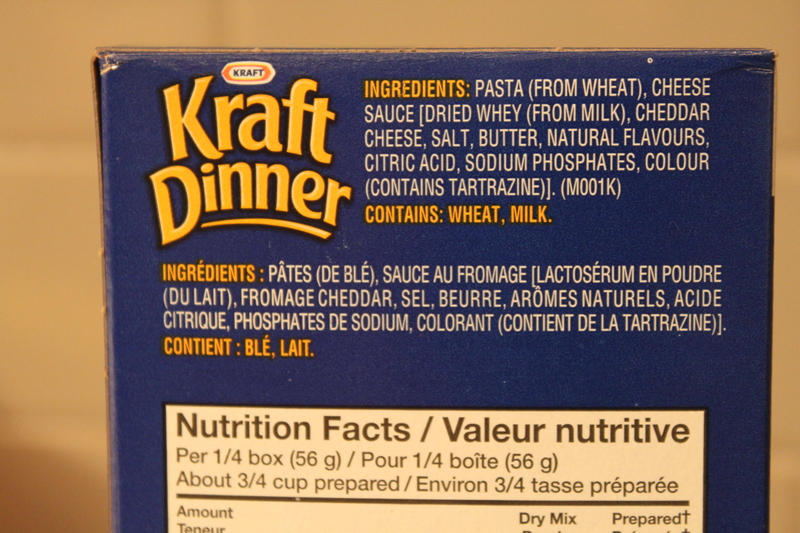 As a side note, in the nutrition facts, kraft dinner comes in at 330 mg of sodium or 13% of your daily value per ¾ cup serving size. Assuming most people would eat double or triple that as well as salt the water, you could be tipping the sodium percentage to closer 40% of your daily intake! There you have it! That is what kd’s ingredient list really looks like. The real question is will it make it into your cart again or will you try making your own homemade mac & cheese next time? All it takes is whole grain pasta, white cheddar, butter, milk and a little sea salt. Be on the lookout for a new recipe to arrive shortly on the blog.